Takahashi Hiroaki (Shotei) was born in Asakusa, Tokyo in 1871 and when nine years old began studying Japanese-style painting with his uncle Matsumoto Fuko (1840-1923). By age 16 he was working at the Imperial Household Department of Foreign Affairs, copying designs of foreign medals and ceremonial objects. 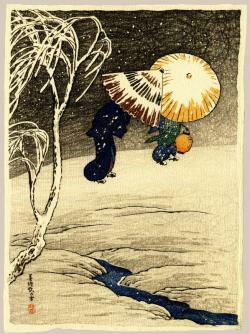 In 1891, together with Terazaki Kogyo, he founded the Japan Youth Painting Society. Later he submitted paintings to exhibitions and also worked as an illustrator of scientific textbooks, magazines and newspapers. In 1907 he became the first artist recruited by Watanabe Shozaburo and at that time began to use the artist's name "Shotei". In 1921 he began to also use the name "Hiroaki". 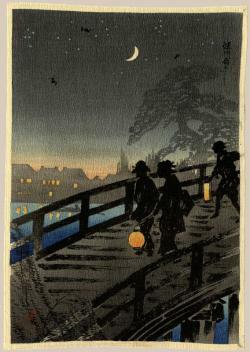 By the time of the Kanto earthquake in 1923, Shotei had produced some 500 prints for Watanabe. The entire Watanabe publishing operation was destroyed in the earthquake and subsequent fire. Post-1923, Shotei produced another 250 prints for Watanabe, as well as some fine larger prints for the publisher Fusui Gabo. In addition, Shotei also produced nearly 200 designs which were published by Shobido Tanaka. Takahashi Hiroaki works were mainly exported to the West, where they were avidly sought by European and American collectors as representive views of "Old Japan"